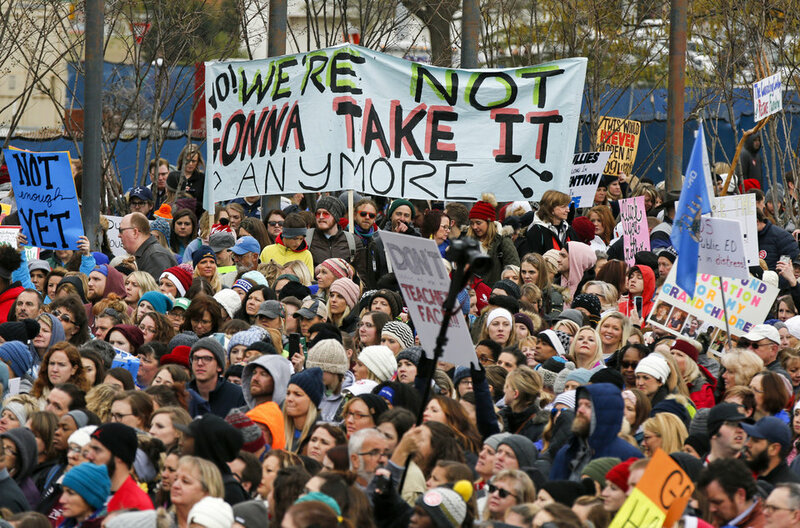 New Orleans Grabbing the mantle of a movement often seems like a first impulse for many protests and campaigns but reaching for it is not the same as being a movement. At the same time there are signs that can’t be missed when a real movement is stirring. I found delightful evidence in what many might find an unusual place between the covers of a recent New Yorker in a deeply reported story by Rivka Galchen about the stirring of Oklahoma teachers and many other Oklahomans. Their cause is opposing legislative logjams and drastic cutbacks in state support of schools that has stripped a billion dollars out of the budget in recent years. Wages are certainly part of their fight, since they only make a fraction of what the West Virginia teachers won recently, but it’s so much more. Heather Cody … helped organize a protest march from Tulsa to the capital [in Oklahoma City]. [Craig] Hoxie [who had organized teachers in a Facebook group] and other teachers packed enough food and water for several days, knowing that they would be walking long stretches through sparsely populated areas. “But it soon became apparent we didn’t need to carry anything,” Hoxie said. “We’d top a hill and then we’d see a family there by the side of the road, with the bed of their truck loaded with water bottles, bananas.” This kept happening. “An interfaith alliance kept feeding us dinner each evening. High schools opened gymnasiums for us to sleep in, pulling out their wrestling mats…We were walking through parts of Oklahoma that have barely even recovered from the oil bust of the nineteen-eighties,” Hoxie said. “They all came out for us. I didn’t know how they even knew where we were.” On the seventh day, Hoxie and other teachers woke up in the high school library in Jones. Several hundred people were waiting outside to walk the last nineteen miles with them. A high school marching band led them the last mile to the capitol, where thousands of people greeted them. Where’s the union? Nowhere? Weakened by these wars. This is a story of people – teachers in this case – stepping up and people voluntarily responding. These kinds of things are the signposts of real movements. The mossbacks of Oklahoma and elsewhere need to be scared. Very scared. The teachers are moving. The people are with them. Change is coming. Guaranteed. This entry was posted in Labor Organizing, Organizing and tagged movements, Oklahoma Teachers by Wade. Bookmark the permalink.